I Love You More Than Carrots: Friday Haps. And Why This Post Took Me Two Weeks To Write. Friday Haps. And Why This Post Took Me Two Weeks To Write. 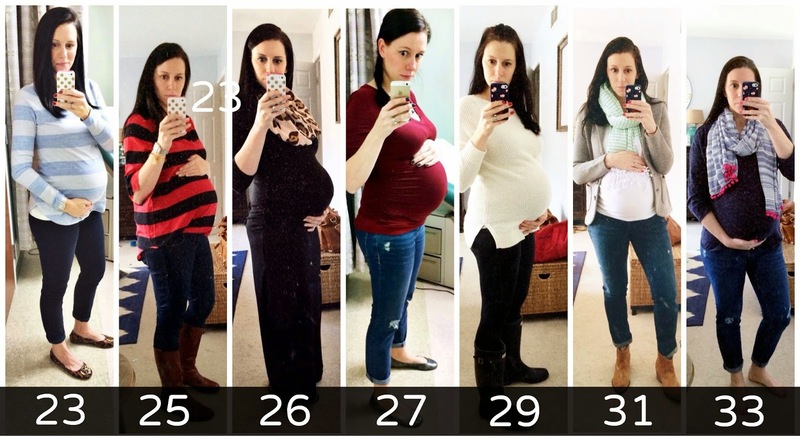 I never meant to stop blogging about my pregnancy, it just sort of happened. The last time I wrote a "bump date" was around twenty weeks. For those that are keeping track, I'm more than halfway through my 33rd week. Yikes. It was around that time that I eagerly accepted a writing position as a Word of Mom Blogger over at WhatToExpect.com and have spent the last two months or so learning to balance (hopefully what is good and decent) content both here and over there. I love writing for them- I've secretly always wanted to write and somehow get paid for it- which, duh, blogging- so being asked to write for them has kind of been like a mini dream come true. Which, if I'm being honest, is kind of like the warm and fuzzies I get from writing here, too. It's really been great. In case you've missed them, I've written the following posts for What To Expect "The Wrong Reason To Have A Fourth Baby," "Say What? 5 Things You Shouldn't Say To A Pregnant Woman," "5 Signs Your Ready To Have A Baby," "How Not To End Up In Couples Therapy When Choosing A Baby Name," "What It's Like To Sleep With My Parents" and have even more up my sleeve in the coming weeks. I'm hoping to have enough posts backlogged to carry me through April and the birth of M3, so here's to some late nights and early mornings at Panera. Anyways, a lot has happened since twenty weeks! I've gained roughly a second grader, went up two sizes in underwear (that's humbling), have gotten no closer to redecorating the nursery or shared big brother's room and find myself adding more things to our growing to-do list than I can realistically cross off before Collins' arrival. Basically I'm in a great place, but really. I need to get it together! The other moms on my birth board are posting pictures of packed hospital bags and fully furnished nurseries and I'm all, "well, I have diapers." Want to know how long this post has been sitting in my blog roll? Two weeks. I'm almost embarrassed to admit that. It's taken me two weeks, in five minute increments each day, to collectively pull together this post and publish it. At this point, I don't even remember the point of it all. I think I had originally set out to write about this last pregnancy. This final baby. And how when the time came to sign my surgical consent that included consent for my c-section as well as the much agreed upon tying of the tubes, I couldn't do it. I couldn't sign it. About how I sat and stared at that single piece of paper with its six paragraphs of words and that tiny little line to sign on- and about how I vigorously crossed out the paragraphs containing any consent of tubes being tied before signing my name. Or maybe this post was supposed to be about the last ten weeks of pregnancy. The things about it that I want to remember- despite how exhausted and uncomfortable I might feel. Things like how this baby seems to want to bust out through my belly button between the hours of 7pm and 10pm every night. About how he still loves fresh berries and yogurt and thick chocolate milkshakes from Chick-Fil-A. About how I started washing all of his teeny tiny baby things in Dreft this week and how I sometimes might stand in front of his closet with my eyes close and just inhale- imagining his sweet, soft fuzzy head tucked beneath my chin. But this post isn't much about anything, really. Just checking in, I guess. Hopefully I'll be back next week to actually write about all those things I listed above and more. You know, some real feelings. When I don't have to sit down in five minute increments to gather my thoughts. Have a great weekend, friends. I'm glad I didn't have a c section or the tubes convo because yes I'm SO done but it's still so final. I was SO much less prepared the 2nd time around. My water broke at 38 weeks, and I sent my husband out to get groceries before we went to the hospital...and completely forgot that we needed to assemble the bassinet. It got done at 11 pm the night we brought the baby home. i love you, i love the mom you and the friend you. but man i love pregnant you too! and adorable outfits. you wear jeans pregnant more than i do, ever! You are adorable. Love your updates! This was cute :) I religiously updated my weekly bumpdates with my first, and now with my second, it's MAYBE every other week, or just once a month. whoopsies.... Congrats on your writing dreams! You go girl! 31 is still my favorite outfit to date!!! So----no tube signage?!?! I can't say that i blame you! you make such sweet babes! And are a dang good momma!!!!!! Stuff Them With Cute. Easter Baskets, That Is!